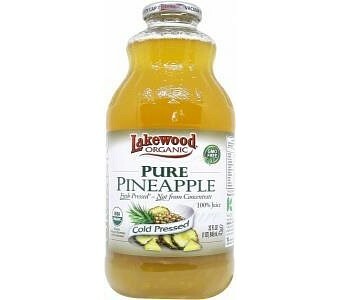 Lakewood Pure Organic Pineapple Juice! This tropical superfruit is a superb source of Vitamin C, Manganese (needed for strong, healthy bones) as well as vitamins A and E. It contains Bromelain, an enzyme that breaks down protein. Some of pineapple's health benefits are as follows: it is an anti-inflammatory, aids in digestion and has been shown to reduce mucus production in the throat It has been shown to be good for morning sickness and sinusitis. It's many health benefits make it a great choice for a breakfast juice or a rehydrating, rejuvinating beverage.